It’s time to address the elephantscrowding up the room. Did you just say that? Well, this is awkward. First off, you don’t know what you’re talking about, and second, you’re making a fool out of yourself. Just when you thought you’re helping out, you’re not. Sometimes, staying mum about a subject that you have no experience whatsoever or have no basic knowledge of is the best way you can help someone who is struggling with depression. 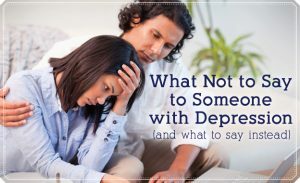 If you keep on saying these eight common insensitive phrases that depressed moms never want to hear, might as well stop before you hurt yourself. Honestly, it won’t. Without proper treatment, depression cannot be resolved by asking the gods for a miracle or some sort. Praying harder wouldn’t take the suffering away, either. Faith has nothing to do with mental illness. Or silently die along with it. Imagine, women being strong enough to live through their pregnant lives without having to worry about depression, what a perfect world that would be! Unfortunately, life is messy, and the world is chaotic so living through with depression is like having a ticking time bomb that is about to explode any minute. One out of seven women will experience PPD, and that is a fact. Though exercise is a coping strategy, it may not work for severe depression. Going out for a walk or taking some time off to bond with friends will not wash away depressive symptoms. 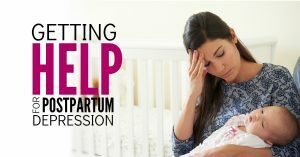 Postpartum depression is not something that goes away with just a touch of a button. There’s no secret handshake to take all the emptiness away. What the person needs is professional help and people who are willing to listen without opposing statements or judgmental opinions. Postpartum depression is about the mother. Mental illness during pregnancy or after childbirth will only affect the child if it is left untreated and the symptoms have gotten worse. Telling a mother to focus more on her baby rather than herself is like riding a crashing plane and instructing the choking mom to first put the oxygen mask on her baby before putting on hers. How can you help someone if you can’t even help yourself? Do you? If you’re saying these empty words for the sake of compassion, you’re turning things around and making the situation about you and your experience with “baby blues.” Fact is, “baby blues” is way different than depression. Also, just because you’ve read it somewhere or did a research about it, doesn’t mean that you are well-equipped to air out consoling words because honestly, you wouldn’t know how depression feels like until you’ve suffered yourself. When a mother is irritated or gets angry at the sight or sound of her child, it doesn’t mean that the green-eyed monster is taking hold of her, making her feel envious of the insurmountable amount of affection the baby is receiving. It is not normal for mothers to feel alienated from their baby primarily because they have carried them inside their wombs for months. If moms are hesitant to hold or take care of their newborn, it’s not because they wanted to but because the mental illness is severely debilitating them to do so. Don’t you think the mother would know that by now? They are well-aware that they have been blessed with a beautiful baby; but because of chemical imbalance inside their brains that can only be resolved by psychological treatments, depressed moms, no matter how hard they try, cannot feel the same amount of gratitude and joy the way other moms feel. This statement, no matter how good the intentions are for thinking that being preoccupied will make the mom “forget” about the condition, is not helpful at all. Depressed moms cannot function like they did before they were overwhelmed by the illness. Carrying such a heavy burden inside without proper treatment and an understanding support group will just worsen the situation. In this period of progression, people are expected to be more open-minded and accepting that there are existing mental illnesses that can affect anybody. Blurting out nonsensical things about a serious medical condition can only add more trauma and stress on the person, thus making her more miserable. Disregarding the existence of depression will only hinder immediate care and treatment. So, think before you speak or don’t speak at all.